Today we are reviewing “The Flying Carpet” by Caroline Whittle. About a lonely Guinea Pig that escapes to a world of magic. Written and illustrated by Caroline Whittle of Out Of The Hutch fame. Caroline is an artist and illustrator currently resident on the Isle of Wight, UK. An art graduate of the Berkshire College of Art and Design Caroline has over 15 years experience as a successful freelance illustrator. A lifelong Guinea Pig lover, and friend of the late great Peter Gurney (Guinea Pig nobility) Caroline is best known for her Out Of The Hutch Guinea Pig range. As a lover of guinea pigs Caroline wanted to be able to buy cards etc bearing their images, but there was nothing available, so she decided to create her own range! Where can I buy “The Flying Carpet”? At Caroline’s shop: Out of the Hutch. £40 for a hard back first addition. Signed and numbered with an original sketch inside. 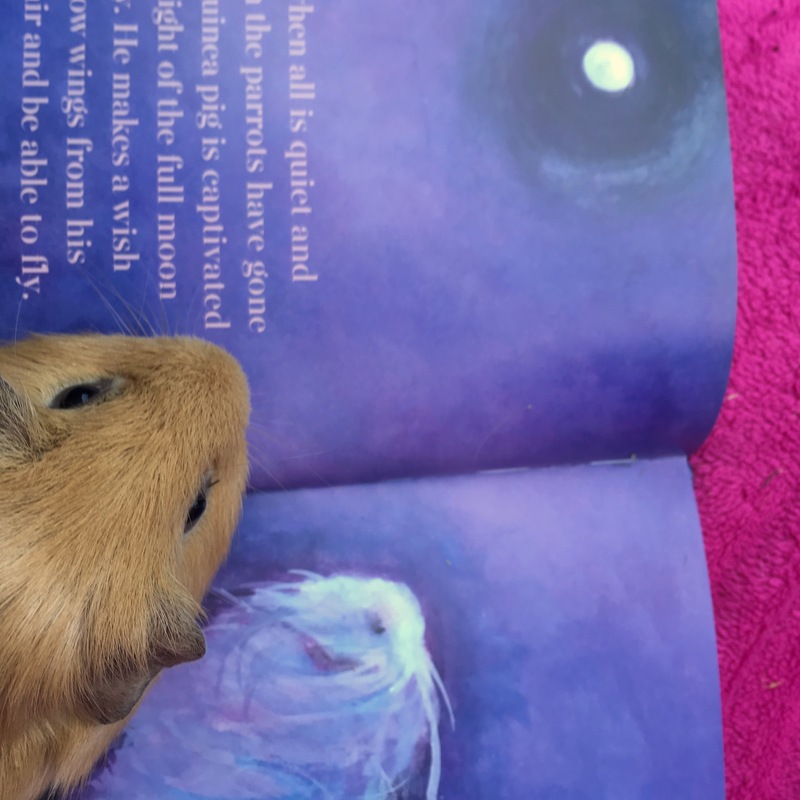 “The Flying Carpet” is a beautiful story about forgotten, nameless Guinea Pig and his escape into a world of magic. I don’t want to spoil the plot but like all good fairytales there is just the right hint of melancholic suggestion to make the eventual magic that bit more special (…”I’m ok, I must have a little something in my eye”…). 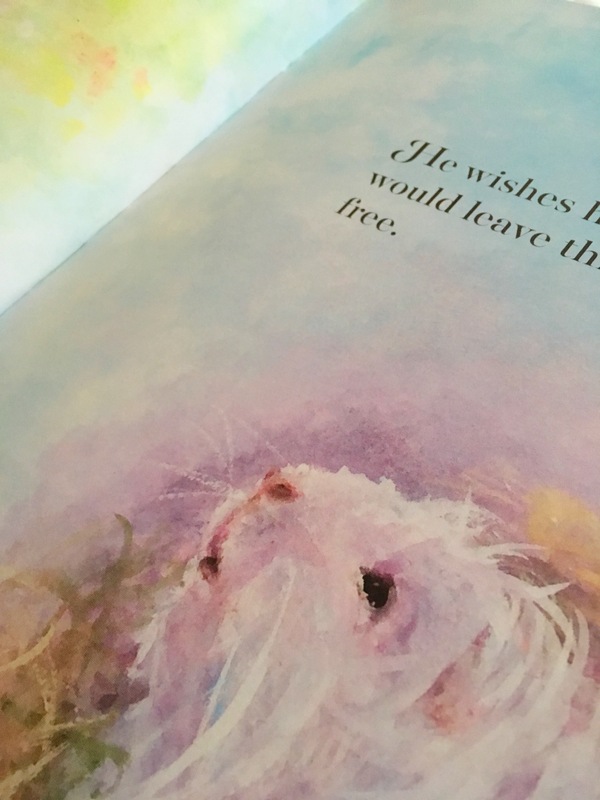 Caroline’s style of art perfectly matches her whimsical storytelling, Caroline specialises in gouache and the soft opaline colours of her piggy protagonist shine dreamily on the page. Physically; the book is strong and solid enough to loved by multiple generations. The pages are thick and of a good quality. The text is in a large strong font which is easy to read for any age. 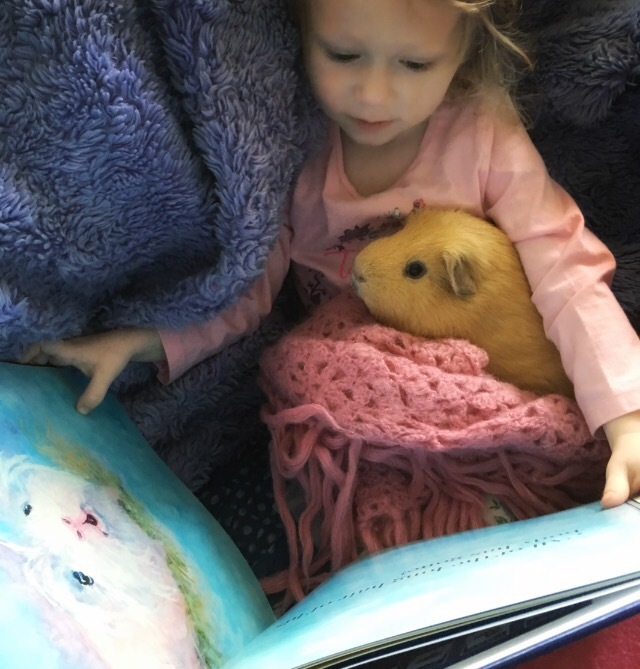 My eldest daughter ‘Squidgygirl’ simply adored the story to such a degree that she insisted on sharing it with her favourite pig Slincypig. 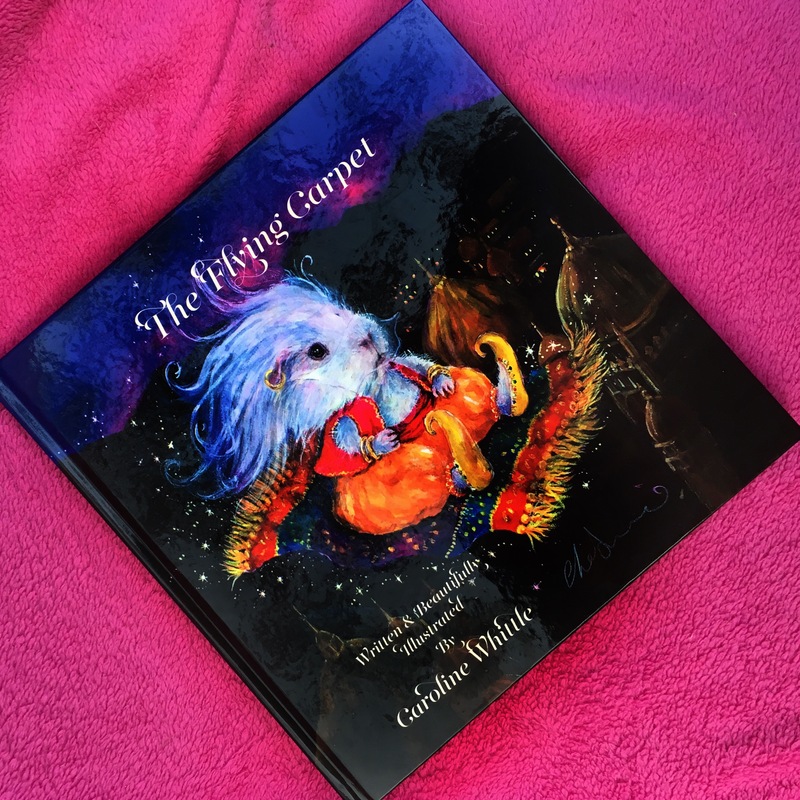 If you are already a fan of Caroline’s work than “The Flying Carpet” is surely a must have. 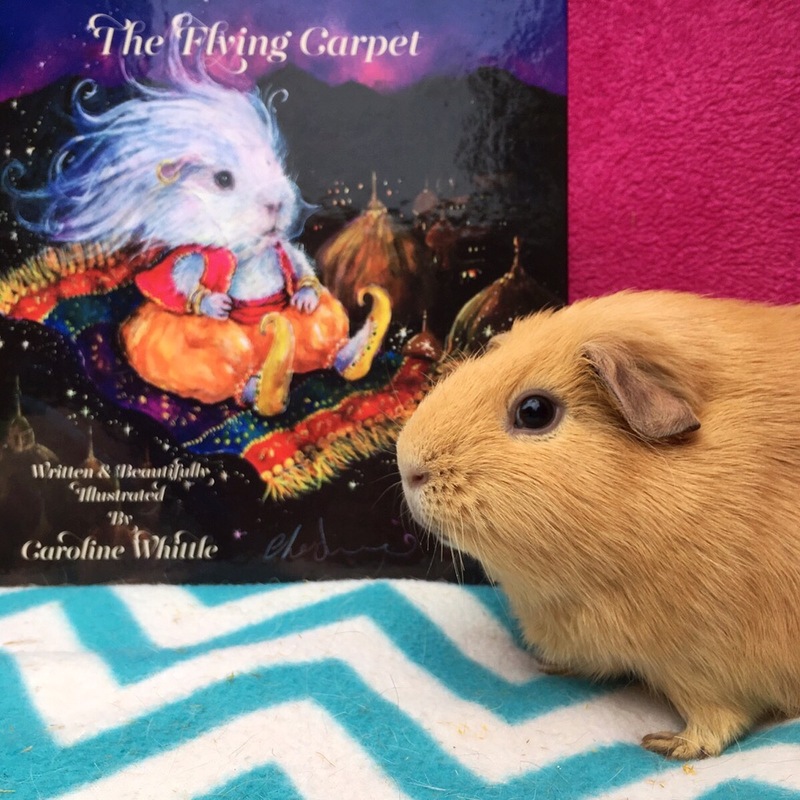 If you are a Guinea Pig lover who is new to Caroline’s work, then “The Flying Carpet” provides a fantastic introduction to the magical whimsy of Out Of The Hutch. Caroline will feature in our upcoming Squidgypigs’ Guide to Guinea Pig Art. Please note: Caroline was lovely enough to send us a copy of “The Flying Carpet” for review. If you would like to know more about Caroline visit her site at Out Of The Hutch. Thank you Rebecca, a lovely review :), look out for his continuing story, starting with his first adventure, where he finally gets a name! Oh fabulous, that’s really something to look forward to! please tell me how to get this in the US!!!! Quiek from my meerlis too. Wonderful book!